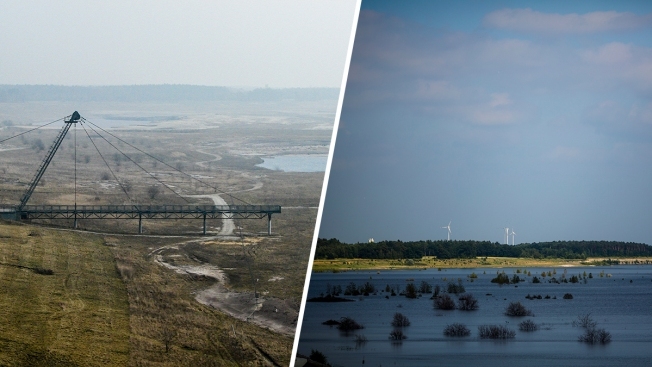 At left: In this March 27, 2012 photo, the area of the lake Grossraeschen See, a former lignite coal pit, is under preparation for flooding in the Lusatia (Lausitz) area near the city of Grossraeschen, Germany. At right: Six years later, trees and windmills are pictured rising out of the lakeside. As the sun beats down on a small vineyard by the rippling waters of Grossraeschen Lake, there's little sign of the vast wound that lies beneath. Meuro, the brown-black mine that once dominated the landscape, providing jobs to thousands of workers who toiled in clouds of lignite coal dust, has vanished. Only a floating excavator plucking sunken trees out of the water hints at the effort that's gone into reshaping this corner of eastern Germany over the past decades. It's part of a massive environmental cleanup in Lusatia, a region that provided much of the coal that heated German homes and powered the country's industrial rise. Unlike its darker variety, lignite seams — also known as brown coal — often lie close to the surface, meaning it is easiest to just remove layer upon layer from above rather than dig underground shafts. "This is a region that was shaped by strip mining for hundreds of years," said Kathrin Winkler, a native of Lusatia. "No grain of dirt was left on top of the other." As a young woman growing up in communist East Germany, Winkler worked in the Meuro mine for a year. Now it's her job to promote Lusatia's lakes as the next big tourist destination, a tranquil retreat for weary city dwellers from nearby Berlin and Dresden. The idea would have seemed outlandish to anyone looking at the alien, lifeless landscape not so long ago. But over the past two decades the man-made craters have been slowly re-sculpted to create 26 lakes connected by 13 canals and hundreds of miles of cycle track. Instead of coal-fired power plants, the horizons are now dotted with wind turbines and fields full of solar panels. While about 22 percent of Germany's electricity still comes from burning lignite — and a further 12 percent from hard coal — some 33 percent is now generated using renewable energy. At its peak three decades ago, Lusatia's coal industry provided more than 90,000 jobs. Now, the region only has a few thousand workers at four mines operated by a private company, including the Welzow-South pit that supplies the 'Black Pump' power station about 20 kilometers (15 miles) east of Grossraeschen. Helmut Franz, who used to work in the Welzow-South pit, said miners support the work that's being done to restore the sites. "People have been trying to figure out for generations how to heal the wounds," said Franz, who now chairs the Senftenberg mining heritage association. "We think it's a positive thing that the countryside is being reshaped after the end of mining." Much of the task of turning brownfield sites into the kind of "blooming landscapes" promised shortly before reunification to East Germans by West Germany's late chancellor, Helmut Kohl, has now fallen to a state-owned company, LMBV. So far it has spent 10.6 billion euros ($12.5 billion) removing the legacy of industry and creating 25,000 hectares (61,775 acres) of lakes. "You could say that it's the biggest landscape reconstruction in Europe that we're operating," said Uwe Steinhuber, the public face of LMBV. "There's no script for this job." While countries such as the United States also require companies to restore mines and Spain's biggest lake is currently being created in a former lignite pit, LMBV's effort to develop an entire new lake district clean enough for tourism is one of the most ambitious projects yet — attracting attention from as far afield as the U.S., China and South Africa. One of the challenges is ensuring that the lakes, which start out having the acidity of vinegar due to minerals churned up by mining, are made safe for animals and people. This is done by flushing the lakes with river water or by pouring in limestone to raise the pH-level. Another problem is the risk of subsidence. Because the earth hauled out of the pits over decades was simply dumped elsewhere, it is very loose. A dramatic and unexpected landslide in 2010 prompted LMBV to re-examine the entire region. "Many areas that had been considered safe until then were re-classed as unsafe," said engineer Soeren Albinus. Creating a string of new lakes has an added benefit — allowing authorities to plan for the potential impacts of climate change on water levels in this part of Germany. Cities such as Berlin depend on water that flows through Lusatia and the lakes are being designed to act as buffer — storing water in times of plenty and releasing it when there's a drought. The region has become a giant laboratory for geologists, economist and biologists. Wary of the artificial landscape created for tourism, environmental groups have purchased some stretches of land and let nature take its course. Animals and plants that have been driven from much of Europe's intensively farmed landscapes, including wolves, the Eurasian hoopoe bird and a plant called great horsetail, are reclaiming areas that were considered dead just a few years ago. Back in Grossraeschen, tourism chief Winkler shows off the new marina awaiting its first sailboats. If all goes to plan, the water will rise by another foot (30 centimeters) in the coming months so the lake can be officially opened for business. Authorities hope to increase the number of overnight stays from the current 600,000 annually to some 1.5 million in the coming years, boosting employment in Lusatia. Young people in particular are benefiting already: the region has the lowest youth unemployment rate in all of Germany. "It's not just the landscape that's changing, there's also been a big, big change in people's heads," said Winkler. "We are moving away from being a former industrial region to one that's part of the service economy." Some locals, she acknowledged, have yet to embrace the hospitality and openness seen, for example, in Bavaria, where tourism has long been an important part of the economy. And there's little chance it will replace all the jobs lost in the mining industry. "It will be one important foundation, but not the only one," she said. Still, for a region which had areas resembling the moon and a stretch of barren sand widely referred to as "the Sahara," Lusatia has come a long way. "The nice thing is that the pride people had for this region is returning," said Winkler.